The Ross Foundation was founded in 1967, by Esther Clark Ross and her daughter, Jane Ross. The initial endowment consisting of approximately 18,000 acres of timberland was a part of the estate of J.G. Clark, Jane Ross’ grandfather, who was one of the early lumbermen of Clark County. During the following years, additional acquisitions were made of various smaller tracts near or adjacent to the original land holdings. In 1993, The Ross Foundation purchased a large contiguous block of land from International Paper Company in Hot Spring and Garland Counties. Following the death of Jane Ross in 1999, The Ross Foundation received additional acres from Jane Ross’ estate. Additional acquisitions of adjacent tracts have contributed to a total land base of over 64,000 acres. The Ross Foundation strives to maintain healthy and productive forestland that will be sustainable long into the future. Since all stands within the forest are not the same, maintaining a healthy forest requires the use of many different management tools to meet the specific needs of each stand-level forest management objective. The Ross Foundation’s land management staff evaluates individual timber stands to establish management objectives for the stand and to choose the management tools or techniques needed to accomplish those objectives. Examples of the techniques used include timber harvesting to meet specific goals in improving stand condition and value, herbicide applications and prescribed burning to control undesirable vegetation, and pre-commercial thinning to remove surplus and competing stems and provide space for the growing stock trees to develop. Objectives set for each stand depend on factors such as species of crop trees, age of the stand and stocking levels, and the spatial relationships of various stand conditions throughout the forest. Examples of stand objectives include sustained timber production, forest diversity, wildlife management (including management for threatened or endangered species) and finally, regeneration using either natural or artificial techniques. Logging operations are a common timber management tool used by The Ross Foundation. In order to maintain a healthy forest, some trees need to be removed periodically. The Ross Foundation uses several types of harvest methods, including periodic stem reduction and improvement thinning, shelterwood establishment operations, and artificial regeneration. By continuing sound timber management, The Ross Foundation’s tradition of growth will undoubtedly carry on. Periodic stem reduction thinning is used to reduce the number of trees growing in the stand. Stem reduction thinning targets inferior or less vigorous stems for removal, allowing the remaining trees to stay healthy, continue to grow and increase in value. Improvement thinning is normally selective logging operations where damaged, diseased, or other high risk trees are removed. Shelterwood establishment operations are used on stands when regeneration is sought. The operation is designed to leave a number of trees of seed bearing age scattered throughout the treatment area to establish seedlings. After seedlings are fully established, the over-story is removed, usually in one or possibly two logging operations. Artificial regeneration is used for several different situations and reasons. A clear-cut or final harvest has the same goal as a shelterwood, but with a different method of producing a regenerated stand. When implementing a final harvest, all merchantable trees are removed and seedlings planted. 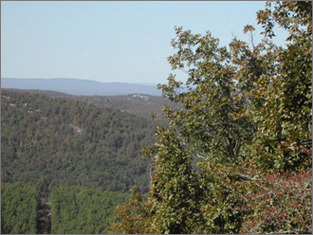 The Ross Foundation land base is located in and along the boundary between the West Gulf Coastal Plain and the southeastern limit of the Ouachita Mountains. Because of the interface of these two physiographic regions, The Ross Foundation has many unique areas throughout its land, resulting in a variety of actively managed timber stands interspersed with pockets of relatively undisturbed natural plant communities. Many of these unique areas contain remnant plant communities with species that are at least locally rare, with a few species that are of rare or limited occurrence at the state or federal level. Other portions of the ownership may have plant cover more unique in age than in species composition, as with more mature pine timber in excess of eighty years of age that may have rare or endangered wildlife present, such as the red-cockaded woodpecker. Individual species or combinations of species found in each unique area may have management requirements that are compatible with those of the surrounding forest management unit, while other sites may be of such a sensitive or fragile nature that most forest management activities are not permitted. The Ross Foundation also may designate certain areas unique for other qualities, such as geology, history, or scenic quality. When necessary for the protection of any unique area, The Ross Foundation may post signs excluding certain types of activities. It is important that visitors recognize and cooperate with our efforts in order to restrict any actual or potential damage to these unique areas. Every year numerous visitors use Ross Foundation land to hunt a variety of game species. The most popular is white-tailed deer, followed closely by eastern wild turkey. These and other upland game species like the eastern cottontail and both fox and eastern gray squirrel can be found as well. Mourning dove and bob-white quail are present year round, and quail populations are showing signs of improvement in some areas. Furbearers such as raccoon, opossum, bobcat, striped skunk (and the occasional spotted skunk), both gray and red foxes, and coyote are equally widespread, while beaver, otter, and mink are found in more limited habitat in and near streams and sloughs. Some of these small wetland sites also have resident populations of wood ducks, with fair numbers of migratory waterfowl present in the winter months. For many, the presence of black bears brings a sense of excitement, and several confirmed sightings have been recorded on Ross Foundation land. Other wildlife forms include numerous small mammals, fishes, reptiles, and amphibians. The Ross Foundation has sponsored surveys performed by both Henderson State and Ouachita Baptist Universities which documented the diversity of species, some of which are rare in this area. The diversity of habitat found throughout Ross Foundation property contributes to the presence of a great variety of songbirds, from year-round residents, including the Federally listed red-cockaded woodpecker, to the numerous neo-tropical migrants found during the spring and summer months. A portion of Ross Foundation land in Clark County is managed cooperatively with the Arkansas Game and Fish Commission and is included in the leased land program as a part of Big Timber Wildlife Management Area (link to AGF?). The leased land program augments wildlife management areas on state owned land. Big Timber Wildlife Management Area is open to anyone with a valid hunting license and Big Timber special permit. Both are available from the Arkansas Game and Fish Commission, along with rules and regulations applying to users of the Wildlife Management Area. Additionally, The Ross Foundation manages approximately 20,000 acres along the Hot Spring and Garland County line, which is available to the public for a variety of recreational activities (link to Ross Foundation recreational user map here). Hunting on this part of Ross Foundation property does not require special fees or permits. Camping opportunities are limited, and registration with The Ross Foundation is required before camping. During firearm deer and turkey hunting seasons, The Ross Foundation requires that all other types of recreational activities be restricted. Visitors coming to Ross Foundation property are advised to read and obey all signs and posted notices at various locations on the property. Some areas are closed to certain types of uses, either as safety precautions or to protect critical habitat or the aesthetic value of an area (link to rules posted here). The use of fire is an integral part of forest management. Prescribed burning not only has the potential to enhance wildlife habitat and promote timber stand health, vigor, and diversity, it is a tool to lessen the occurrence of catastrophic wildfire. The Ross Foundation’s fire management program uses prescribed fire for specific objectives or for a combination of objectives, and that prescription is implemented under controlled conditions. Each objective usually requires a different method of burning, and a different season or time of application. Hazard reduction (link to picture), a controlled burn to reduce fuel load, is conducted during the dormant season, or cool weather, to reduce the risk of catastrophic wildfire and to make those fires that do occur much less dangerous and destructive. Woody brush control (link to picture), a prescribed burn implemented to kill or retard unwanted species in competition with desirable species, is more effective when done during the growing season, or warmer weather, when it is easier to create the desired amount of heat at ground level needed to kill the target species. Site preparation fires (link to picture) are done to remove excess logging slash and other debris to clean an area for regeneration. Fire also reduces the number of insect pests that may attack newly planted seedlings, and releases nutrients to new seedlings as they become established. Plant and/or wildlife habitat management is sometimes a target objective of prescribed fire, and is often an added benefit of most control burns. Many native plant communities (link to picture) which have evolved with naturally occurring fire now depend on prescribed burning to remain intact and viable. Both hazard reduction burns and brush control burns will result in more succulent and nutritious ground cover vegetation for wildlife use. Browse plants are beneficial to deer, cottontails, and wild turkey, while the presence of other seed bearing and herbaceous species benefit bob-white quail, wild turkey, and various songbirds. As urban sprawl and proliferation of country living continues to grow, smoke management has become more of an issue with which fire managers must deal. The Ross Foundation strives at all times to conduct burns so that smoke from fires does not adversely affect people in the surrounding area. Pre-burn planning for each burn day includes coordinating forecasted wind directions and other climatic conditions with burn site location in an effort to minimize smoke drift into sensitive areas such as residential areas and nearby highways. Note: Provide a link to the post here regarding our current burn scheduling? Allow users the ability to sign up for a notice via email with regard to scheduled burns on Ross Foundation property? This would be in addition to what is posted on the main page of Ross Foundation website?